The first backpack vacuum designed specifically for home use, the VX2000 is like an ultra-light hiking pack. 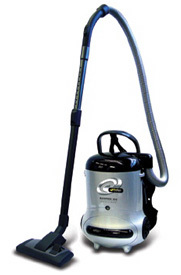 Weighing just 9 pounds, it is mobile, versatile and convenient – where as other vacuums are awkward and cumbersome during cleaning. Since studies have proven that backpack vacuums clean significantly faster than standard upright vacuums, we invite you to clean with us – the ProTeam® way. Carry the vacuum comfortably and ergonomically across the hips like an ultra-light backpack. Remove allergens and toxins for better in door air quality. Clean up to 50% faster than traditional uprights and canisters. Ergonomic handle with suction control. Select from specialized tools for every need. Optional powerhead attachment or Turbo Nozzle available. Micro Filter Media: 395 sq. in.